You could be anyone doing a bit of last-minute shopping on Christmas Eve at the Riverside Mall. You've got your coat and your purchases (scented candle, flashlight, and Hickory Farms gift box), but where did you park your car? This part of the mall doesn't look at all familiar, and the only signs here ("Pictures With Santa" and "Parking Lots A-G") both point east. 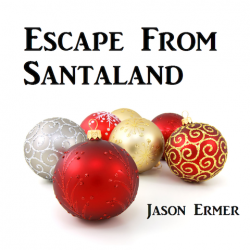 Escape From Santaland (Jason Ermer; 01-Oct-2011; Z-code 8). IF Comp 2011: 4th place of 38 entries. Download Santaland.z8 from the IF Archive. Escape From Santaland - at IFDB. Escape From Santaland - at ifwizz interactive fiction (in German). This page was last modified on 21 June 2016, at 11:15.